Like reducing withdrawal fees like they did last night wasn't enough to make Juicy Stakes Poker one of my favourite online poker rooms, now they've gone and offered to double my deposits this weekend! The 100% reload bonus available all weekend can add up to $100 extra to players’ accounts. 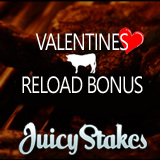 To claim this reload bonus players should enter Reload Bonus Code FEB2014 when they deposit. To reward frequent players, Juicy Stakes recently announced drastic reductions in its withdrawal fees. Players that earn 100 FPPs in the month of their withdrawal can now make as many as four withdrawals that month at a new reduced withdrawal fee of only $50. This is for withdrawals by check up to $1,000; Western Union withdrawal fees have also been cut.